Fulton Boiler, founded in 1949 to market Lewis Palm's revolutionary invention of the vertical tubeless boiler, has been at the forefront of boiler system innovation ever since. 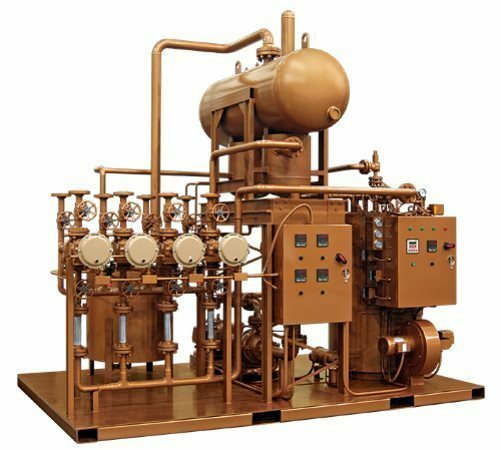 The high quality of Fulton boilers has enabled them to sell over 100,000 vertical tubeless boilers to date, and many of these are still in use in various industrial/commercial applications even after decades of intense service. ATI of New York understands that pre-packaged boiler systems do not always optimally meet the needs of every client, which is why we have chosen to facilitate for our customers the acquisition of Fulton Boiler's custom-engineered boiler systems. Fulton Boiler's engineers are adept at the manufacture of custom-engineered steam and hydronic boiler systems that precisely match each client's preferences and optimally serve the intended application. These systems are primarily portable, skidded "boiler rooms" that can be built at nearly any size and shape and shipped direct in a weather-tight container. Fulton has been designing and building custom-engineered steam skid systems for over 30 years, and their staff is correspondingly skilled at performing the task. Fulton's engineers can consult with you personally to answer any questions you might have and help you identify which specific elements you want included in your new boiler system. Fulton Boiler's skidded steam/hot water systems come pre-piped, fitted out with all the accessories, and equipped with high-quality features like a precisely controlled chemical feed system, single-point drainage, extremely effective water softeners and carbon filters, and programmable timer-based bottom blowdown, which removes sludge deposits from boiler bottoms to maximize their lifespans. An engineering staff with decades of experience and that is willing to work with you one-on-one to ensure your boiler system is the best it can possibly be. Complete skidded systems from a single source, which simplifies and speeds up the acquisition process without compromising the quality. Ready-to-ship units that are fully pre-inspected, use common headers and utility connections for quick and easy installation, and are simple to work with and maintain. ATI representatives can assist you in selecting the components of your custom-engineered boiler system and offer you exclusive contracts with Fulton Boiler.